Success: Your download link is on its way via email within the next 15 minutes. Enjoy the rest of the post . Press releases play an important role in a business’ overall communication strategy. Many businesses use press releases to create awareness and generate publicity. However, writing and sending out an ordinary press release is not enough to catch the attention of the most important audience you want to reach. This is because every day thousands of press releases are being written and distributed. A recent Forbes Magazine article said approximately 2,000 press releases are sent out to journalists every day. If you’re in the financial services industry, you must know that there is cutthroat competition for publicity, awareness and media attention. In this post, we will talk about 10 techniques you can use to make your press release stand out from the crowd. Spend enough time to find the most exciting and interesting angle in what you are announcing. If you have a number of things you want to highlight, try to focus on 1-3 key items. Chances are you will find one or two really interesting and attention grabbing information that you can use as the angle for your press release. One of the least used techniques in press release writing is what’s called telling the story behind the story. This means aside from focusing on the obvious hard ‘news’ element, you can also highlight the ‘news behind the news’ angle. For example, when Qantas shares finally turned around after being in the doldrums for almost three years, the big headline story was about the company’s move from its worst loss in history to multi-million profit. That was the hard news. But the news behind that news was how Qantas CEO Allan Joyce made the tough decisions to ground flights, reduce staff and other cost-cutting measures. The story behind the story generated more publicity and media coverage for Qantas and its CEO long after the main news had faded. A great way to back up and make your press release stand out is by using statistics. The media love numbers, trends, patterns and statistics that can make a good story even better. For example, instead of just writing that your product is being used by many users, try to break down the number of users by state, industry, suburb or gender. List down the groups of people who actually use and benefit from your products. For example, if you have a budget calculator, identify the spikes and increases in usage on a particular time of the day, the week or the month. If you have a stock picking service, find out what time of the day or day of the week it is heavily used by traders and investors. Highlight those trends and stats to make your press releases more interesting. An insightful comment or analysis can add a lot of weight and credibility to your press release. Try to capture the voice and personal view of a credible source as it will be more valuable compared to motherhood statements or industry jargons. What works best is if you use analogies and anecdotes that usually paint a picture. Use words that will make it easier to understand and visualise what you are writing about in the press release. It’s true that a picture could paint a thousand words. So, if there is an opportunity to take a great photo that will go well with your press release, by all means, do it. If your product or service is being used by a particularly interesting group of people, take photos of those product users. Most of the time, photos of people are more interesting and eye-catching rather than just using a plain picture of products. Take pictures of people in action as they convey more information and helpful in telling a story. Stay away from head-and-shoulder pictures as much as possible. By using captivating pictures, action shots and photos that convey emotions, you are helping your press release to stand out from the crowd. In his book, The Ultimate Sales Machine, the late author and corporate trainer Chet Holmes, emphasised the need to give more information to customers and potential customers. He believed that an informed customer tends to buy more if they know more about a product or service. The same is true when dealing with the media and in pitching your press release. If you provide journalists with relevant background information, you will have better chances to get them interested and writing about your story. The idea is to give as much relevant information as possible. Make it easy for the journalists to do their job. As much as possible, give them the hard-to-get information that will take them a long time to find. It also helps in building your credibility as a source of useful and helpful information. The corporate world is littered with jargon, big words and industry terms that can be confusing at the best of times. If you want your press releases to stand out, you will be better off using simple, clear and easy to understand words. Remember your main objective is to be understood and for your press release to be picked up and used by the media. If your writing is full of acronyms and terms that are only known to those in the industry, most likely your press release will be ignored or at worst, be deleted. As much as possible keep your sentences to 25-28 words. Offer an exclusive story to the most relevant media. Most of the time an exclusive story will get more prominence and deliver more mileage. Know the beat (area of coverage) of the journalist you want to pitch to before approaching her or him. Pitch your story to the most appropriate and relevant journalist. Know if a journalist wants to receive communication via email, phone or social media. Don’t call journalists during their deadline. Another great way to make your press release stand out is to use social media channels to share and distribute it widely. Many journalists are also becoming heavy users of social media. This is another channel for reaching out to your media contacts if they prefer social media than traditional communication channels. Some companies use social media channels to announce or to comment on breaking news. This can be an efficient way of reaching out to your media contacts who use those channels. It can also be an effective way to get your message to media outlets in the form of background information or advanced notice for breaking news or an upcoming announcement. In this age of digital technology, using online distribution channels is an additional way to make your press release stand out. With hundreds of online press release distribution services (some are free) available, you can reach a wider audience in as many regions or countries as you like. Though you still have to be selective on which provider or site to use, online press release distribution channels can open up new opportunities that were not available before. Most of the paid online distribution channels offer search engine optimisation (SEO) components which include distribution to news sites and automatic social media posting via Twitter, Facebook and others. So, if you want to optimise the reach of your press releases, you might want to include online distribution channels to your overall marketing strategy. Video content is gaining more popularity each day. And not only in social media channels. Have you noticed how even newspapers (those with online versions) are using video in their news presentation? Video is fast becoming the preferred channel not only among millennials but also among the time poor and more mature audience. So, if you have the capacity and resources, use video as part of your press release. Even a 2-3 minute video clip about the highlights of your news will create another dimension to your press release. Similar to video, animated illustrations, charts, graphs and infographics are becoming part and parcel of the news distribution process. A well-illustrated press release or a news story with an infographic will be much more interesting and usually easier to understand (to explain) than a pure text press release. This is particularly true if you are trying to explain a technical or complicated topic. So, if you want to make your press release stand out, try to include some illustrations or infographics. These are just some of the basic but practical techniques you can use to make your press release stand out. Try using a couple of them or all of them and see how they can make your press release stand out. Contact us if you have any question or if you think we can help you in making your press releases stand out. We put together a guide outlining the 8 simple rules to boost your media coverage. Apply them today and see the results for yourself. You are in. You should receive an email donwload link within the next few minutes. Enjoy the increased media coverage. Are Your Press Releases Being Rejected? 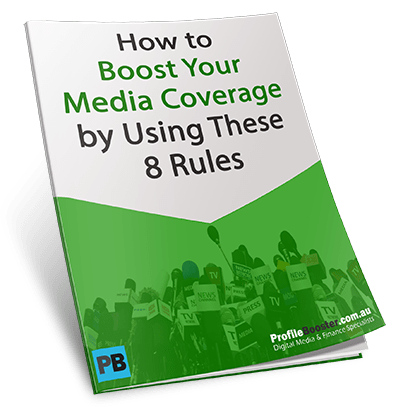 Get Access to the 8 Simple Rules You Need to Boost Your Media Coverage!